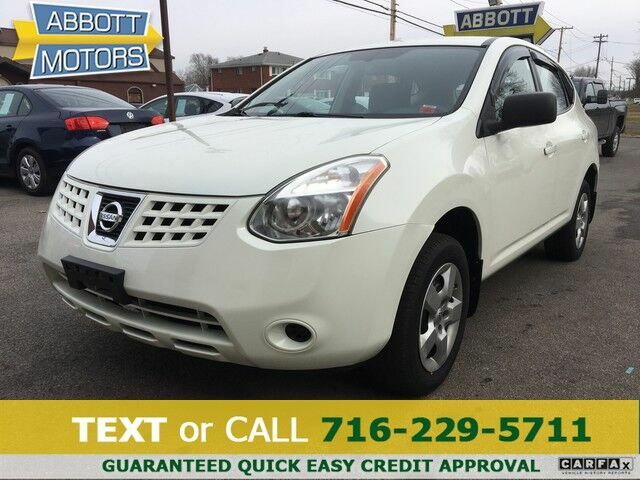 ABBOTT MOTORS, An exceptional car buying Experience, is offering this exceptional Phantom White Pearl 2008 Nissan Rogue AWD S for sale. This low mileage vehicle has a Clean Carfax and has been well maintained. All or vehicles are fully serviced and safety inspected with Warranty. CALL or TEXT (716) 229-5711 for quick answers to your questions about this vehicle. Your message will be answered by a real human never an automated system When you purchase a vehicle with the CARFAX Buyback Guarantee, you're getting what you paid for. The Nissan Rogue AWD S offers a fair amount of utility thanks to its advanced features and unique styling. It's also quite sporty, and injects an ample amount of handling chutzpah into the ridin'-high body of a family-friendly SUV. Enjoy safety and stability with this all-wheel drive vehicle and drive with confidence in any condition. Exceptional in every sense of the word, this incredibly low mileage vehicle is one of a kind. This gently driven vehicle has been well-kept and still has the showroom shine. The Nissan Rogue AWD S is in a class on its own. So much so, that Nissan didn't miss a beat when they loaded this vehicle with an abundance of a-la-carte options. This car comes equipped with all-season tires. Premium paint with no visible signs of damage or degradation is another reason to consider this Nissan Rogue AWD S. ABBOTT MOTORS has over 50 years of automotive experience! We are also a CARFAX Advantage Dealer. We offer great deals and specialize in FINANCING FOR EVERYONE-ALL CREDIT APPS ACCEPTED! We look forward to helping you purchase your next vehicle. More information about the 2008 Nissan Rogue: Fuel efficiency is a major selling point for Nissan's new 2008 Rogue crossover; EPA fuel economy figures range up to 22 city, 27 highway. The interior promises to be flexible for cargo demands, with a front passenger seat that folds flat, and Nissan also says that the Rogue is one of the longest vehicles in its class, allowing good back-seat and cargo space. Strengths of this model include fuel efficiency, Contemporary styling, cargo flexibility, and low price. STOP IN TODAY or Apply Online 24/7 at Abbottmotors.com ... All Trade-ins Welcome... Same Day Delivery... Call or Text Today and See The Difference... We Look Forward to Serving You! !This vehicle may be subject to potential open recall(s). Vehicle recall information may be found at Safecar.gov. Please verify price, equipment, options and features with your sales rep before your purchase. We Look Forward to Serving You. *Tax, title, plates extra. All Financing On Approved Credit. BBB accredited A+ member.